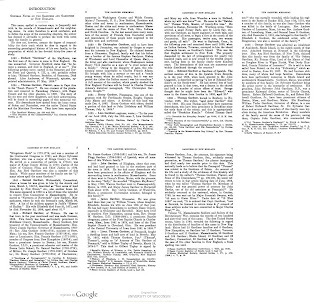 In his book (pages 1-3 1907, pages 1-7 1933), Dr Frank (and using WikiTree) lists the Gardners who were in New England early enough to be concurrent with Thomas' life. His list is shown here (see TGS.org for images). We will collect other lists, to boot, to account for the additional information that has become available the last 100 years. My wife is descendant from both Thomas of Salem (direct) who provides the main theme for this blog and Thomas of Roxbury. For now, we don't know the relationship (if any) between the different families. At some point, perhaps, like some families who have tried to identify commonality, sometimes via genetic matching (to wit, Graves, Frost, and more), there may be a Gardner effort. As many people admit, it's easy to get the families mixed up. In fact, as Dr Frank mentions in his book (1907, pg 16), some have confused, in the Salem family, Thomas the son with Thomas the father (we will look at this further, later). For each of these, we'll provide a pointer to major work that has been done for the family. And, we'll show how they might have melded over the generations. 10/13/2010 -- Added a few links. For each of these, we'll have a separate post. 10/22/2010 -- We can add in other Gardner families who may have arrived later. An example would be Jasper Gardner. 10/27/2010 --Cyndi's List is a great resource. She has three Gardner-related links. Site related to George Gardner of Rhode Island (mentioned by Dr. Frank). 03/07/2011 -- Will note when I run across work being done for the other families (example pedigree for a grandson of John of Hingham). 03/30/2011 -- George E. Kimball III is a descendant of John of Hingham. 05/02/2011 -- At some point, we need to look at the ancestry of Thomas (and Margaret). There is one book that suggests a relationship between Thomas of Salem and George of Rhode Island (published 1907) without saying how. 05/08/2011 -- Updates will be collected in a new post. 04/23/2012 -- Conjectures are nice, if supported; in fact, we'll have an example of that shortly in regard to Thomas and Margaret. There are too many gaps, in many cases. We can't just fill these in without some thoughtful reason. Some families have on-going research that is supported by DNA analysis. One that I found to be interesting is the Gordon family's work. 11/27/2012 -- George is written up in Wikipedia. 12/14/2012 -- This has been a popular post. Also, see Pg. 22 of A home of the olden days (1872) for an example of the two Thomases that Dr. Frank was mentioning. 01/11/2013 -- The question was first asked on 05/05/2011: Did Thomas of Salem have a sister named Rachel? Put her on the list, as she and her husband, Thomas, came over in 1630 (we need to identify female Gardners, too, who arrived early). See Gardner work being done at familytreecircles. 06/15/2013 -- Was there a Thomas and a Thomas? 08/22/2013 -- The start of a look at what was what in early Salem (and New England) as far as Gardners is concerned. --- Also, added a caption to the image (which will be standard henceforth - plus edit of existing posts to make sure that images are clearly marked). 08/25/2013 -- On a site dealing with descendants of Alice Freeman, Abigail Gardner is on the list due to marrying John Wise. Hence, her father and grandfather are there, too. Thomas (before 1595 to 1638), father of Thomas and Peter. The site, by Chris Chester, is wonderful in its use of sources; too, I really like the format. We need to do something similar for the Thomas Gardners. 11/06/2014 -- Gardner Research will have this topic as one of its foci. Too, whence: general and particular. 01/03/2015 -- Benjamin Gardner of Boston/Salem (ancestor of Heather Wilkinson Rojo). 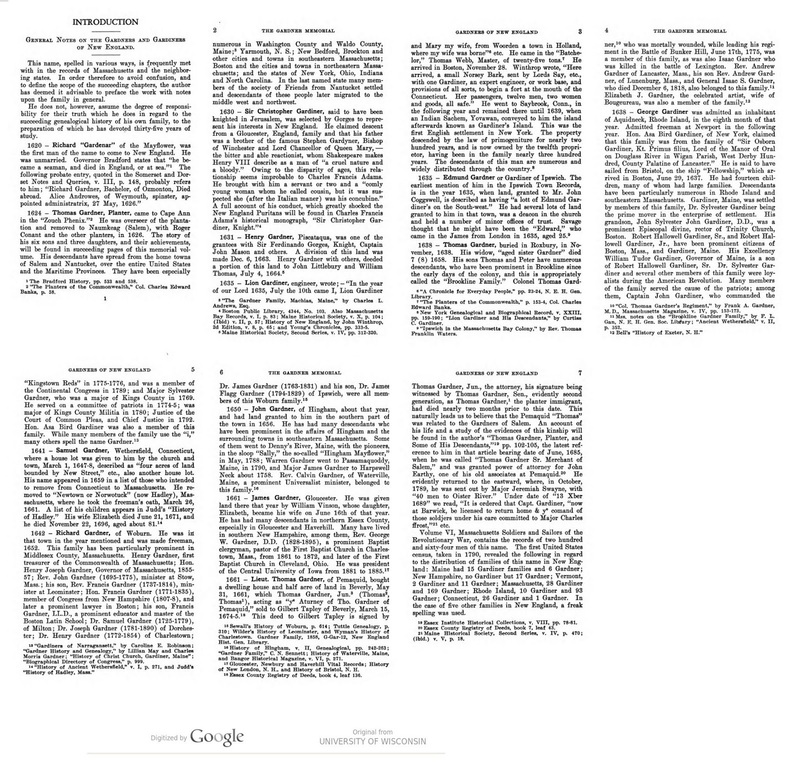 03/12/2015 -- 1933 Gardner Book (update of Gardner list - see above). Dr. Frank's work between the first and second books is obvious from these images. 06/23/2015 -- Looking further at Rachel Gardner. 07/04/2015 -- Walter Goodwin Davis is a descendant of James Gardner of Gloucester. 05/27/2016 -- Lots more information now. 07/16/2016 -- Related work: Gardiners and Gardners. 08/01/2016 -- King Slayer's Court. 10/11/2018 -- For a long time, this was our most popular post. Then, it was surpassed in readership by Marriage of Thomas and Margaret and Plus or minus the arrival. And, these are continuing research subjects. We have taken a theme of All Things Gardner, somewhat. Plus, we have to deal with whence, motivation, and a whole lot more as well as document the first five generations. We are going to collect a whole bunch of pointers here. These will be organized, at some point, with commentary, as necessary. Parts of the family. In his book, Dr Frank mentioned the problem of collecting materials from parts of the family who resided outside of New England. With the web, we ought to be able to point to, or collect, material from anywhere. At some point, a repository will be necessary, it is assumed (Essex Institute, NEHGS, other). Maine Gardners -- This line is Samuel/Abel/Israel. My wife's line is Samuel/Abel/Abel. Related families. For now, pointers. Kimball -- My college roommate was a Kimball. My wife's tree has Kimball appearing several times. Evidently, Thomas built a house at Cape Ann (there is a book about this written, that I saw at the Essex Institute, by a John Gardner descendant). Did Endecott move this house to Salem? Did it then move to Boston? John White's The Planters' Plea -- when I looked at this, I thought, did he sell his nephew down the river? Higginson never mentioned Thomas, though he spent several years in the Salem area. 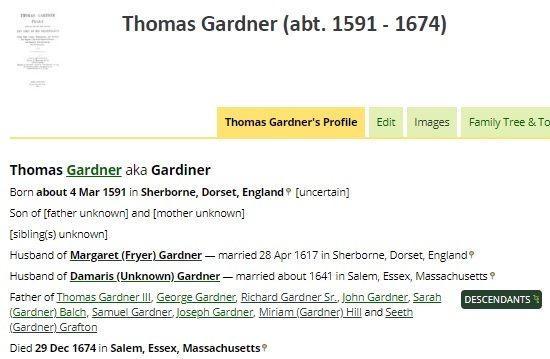 His progeny married into the Gardner family, whence some of the Cabots are on the Thomas list. Too, Higginson Books published Frank's book. It's imperative to have a listing of blogs that might be of interest or that might set a good example of how to organize the material. Ole's blog (olelarsonsfolks.net/Blog/category/the-ancient-past) -- liked his take on the royals (RD) -- Ole's site lost its context which was wonderful. If he is deceased, we'll greatly miss this material. 04/07/2015 -- We have more questions than answers (research raises both). 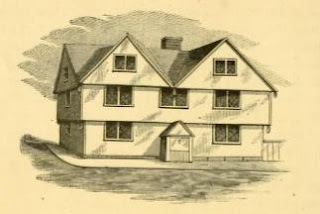 10/24/2012 -- John Goff (Salem's Witch House ..., pg 24) writes: After his arrival downtown in 1628, Endicott ruled that the old Thomas Gardner "Governor's House" from Cape Ann (built about 1623) be dismantled, moved by sea from Cape Ann to Naumkeag and be re-erected in earliest Salem to serve as a new Governor's House here. It stood north of the old shawmut on what is now Washington Street. 08/15/2011 -- Added image for the house (Margaret's house) that Thomas built. Expect to see more about this. The material, of course, was brought over. It was supposedly finished in 1624, taken over by Conant when he got there, and moved by Endecott to Salem. Collecting stories about this. 06/20/2011 -- On methods other than bounded paper. 05/05/2011 -- On Ebenezer plus Balch and Coffin. 12/24/2010 -- Need to answer the question about Ebenezer (Maine, Samuel/Abel/Thomas). Plus, here is an interesting page. 10/29/2010 -- We can use the first couple of generations as the basis to establish the inter-family relationships. 10/13/2010 -- We need to start a bibliography, with categories. Let's start to look at the full Gardner tree using the children, in order of birth as given to us by Dr Frank. For each child, we can have pointers to existing work that is readily available on the web. This post's information definitely will expand in time, so expect the post to update on a regular basis (perhaps, at some point, we'll have a category for each of the siblings). From time to time, another post will start, but we'll keep them linked. Given that not discussing the living is smarter than not (see below), then, we can use Dr Frank (for Samuel) to look at how the Gardner tree expanded through time. Samuel (1627-1689) - see Dr. Frank's book (page 74) which includes Dr. Frank's father, Stephen Wilson Gardner whose mother, Lucy Foster Wilson, has several royal gateways in her tree, including Elizabeth Stratton/John Thorndike. We can use his tree as an example to discuss the unfolding of America as represented by New England. One of his grandmothers was the sister of Hathorne; there are many other ties (no accusers, though) to the madness of 1692 (for example, Mary (Ayer) Parker, Sarah Lord, Samuel Wardwell) which we'll collect. Sarah (1631-1686) - descendants of John Balch, namely Benjamin and Sarah (Gardner) Balch's progeny. Note, that the old planter list includes Balch, Conant, Woodbury, Palfrey, and Trask. This list shows up in many places. Every occurrence of this list is another overlook of Thomas (sort of like negative royalty). There is a lot more that can be collected in regard to the kids. Perhaps, a task might be to browse Dr. Frank's book and collect those here around the turn of the 20th century. That is, they would be along the same level in the overall tree as Dr. Frank and August Peabody. Another thing to do would be to estimate the number of descendants of Thomas which would include those from the daughters in the tree. The count would have to be in the 10s of thousands. That is, at this current generational level, assuming 3-4 generations concurrent. How many can we identify? Of course, the number would be smaller for those with the name of Gardner. Now, in total, that is, for an accumulative number from the nine kids, we would be talking high 6 figures to low 7 figures. Easily. We have our work cut out. Fortunately, Facebook, with its current status of 1/14 humans registered, shows that we can work with sets of that cardinality. Aside: in regard to public exposure via the web, no amount of cyber material encompasses the physical. At some point, perhaps, common sense will kick back in. Though, in the Facebook age, one wonders to where common sense might have fled. Anyone know what adolescent angst will be fired up due to ones earlier years being documented in a public mode? 01/18/2019 -- Added to the index at TGSoc.org. 01/03/2013 -- Updating pointers to rootsweb databases. 08/11/2011 -- Descendants lists for Seeth/Joshua Conant (Conover, Conant, Carter). 03/16/2011 -- Nathaniel Bowditch could start a list of major contributors. 10/29/2010 -- We can use the first couple of generations as the basis. 09/26/2010 -- Counting was mentioned. However, using the computer for this would be the smart thing. If people have files to submit, that would be great. I can also look at rootsweb trees. The main problem is to have a method for verifying what is there. We really want to have the strongest information available. But, too, some like Kathleen (thanks) have done us a favor. 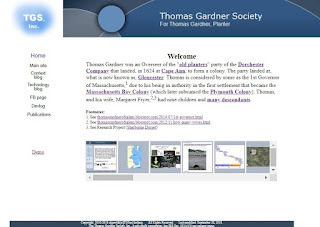 This blog of the Thomas Gardner Society, Inc. will deal with genealogical, and historical, material with a prime focus on Thomas and Margaret (Fryer) Gardner of Salem, MA. Too, it can serve many other purposes, such as to facilitate collection of material, to help organize information from disparate sources, and to promote discussion about these matters. Here are some opening questions that are good examples. Who was Thomas, and Margaret, and what is their ancestry prior to the arrival on the Zouch Phenix (Great Migration Ships, via WikiTree)? Where was Thomas, and Margaret, between the period of 1626, when the move from Cape Ann occurred, to 1636 when he was added to the Freeman list of Salem? Where is Thomas? His burial was paved over. Some stones that were in the area at the time were moved to a nearby cemetery. Where are these? There will be a running list of questions that will be maintained and researched. Blog posts will deal with the related work (see Section of process, below). Now, we know a lot about Thomas from the work of Frank A. Gardner, MD (see TGS.org) and his progeny (see the descendants list on the Wiki page). However, this work covered the period until the early 20th century. Evidently, there needs to be work done to bring that information up to date. One of our goal is to get that accomplished. We need to learn more about Margaret. Some even have Thomas as married to unknown. We are presuming, as did Dr Frank, that Margaret was the mother of the Gardner kids. The Secretary/Treasurer of the Society is a direct Thomas descendant through Samuel as was Dr Frank. I only have an in-law association with the Gardner family. As well, I am not a genealogist but have done a lot of research in my years. My experience is applied mathematics and computing. The past year of researching my wife's tree has piqued my interest. That the NEHGS weds 'historic' and 'genealogical' really describes the proper viewpoint, in my mind. So, the blog will be wide-ranging but will keep coherency. There are many topics that will deal with other family trees. One estimate that I saw was from a researcher who had collected 180,000+ ancestors in his work. In the case of my wife's tree, there are 200+ early entrants (pre-1670) just into the New England area with all of these families coming forward in time. That is a whole lot of people to consider. Bringing in folks from before the migration period really explodes that number. Of interest to me is the whole notion of royal descent (RD). In the past, this status (for want of a better word, for now) was claimed by only a few and was used as a means to stand out. However, some estimates of those who have RD is very large indeed. But, it really does have historical significance. For one, knowing of this may really increase appreciation for those who ventured over here from a known situation to one that was unknown. Yet, things were pretty bad over there for many. Hence, the flux occurred across the waters. There are many topics here to discuss in regard to RD (Ole's blog, example). Thomas Gardner represents several things, such as the backbone of the country and economy, for various reasons. This will be a continuing topic since his life can be used to discuss current topics, themes, problems and what have you. There was not much written about Thomas and Margaret, but their offspring all lived to be contributing adults. And, some of the Gardners helped found tremendous families, such as is the case with Sarah and the Balch folks. Too, Thomas had to be a guy who was comfortable with himself and who was very effective as he showed with his successful traversal of troubled, and hard, times such that he and his kids thrived. That is a real brief look which will be expanded upon. To look at Thomas' kids, one could not but think that the guy was a terrific human though he did not flash across the sky. Now, having said that, not being in the radar does have its benefits. There are no records like this one (Boston martyrs) which we see related to John Endecott. Too, for a long while, Thomas was dropped from the list of 'old planters' despite being in the early group. That is, we'll show several lists in which Gardner is not mentioned. One family of those who seemed to have pushed him out has a cemetery not far from where Thomas was buried. That cemetery is still there, prominently besides the road. Thomas is under pavement, somewhere. To me, an outsider, that little bit of reality represents a whole lot of stuff that we'll go into more deeply. So, we'll use the cyber realm to document, permanently, where Thomas lies, or as close to it as we can identify. If it was not obvious, let me state the following: the 400th anniversary of the Cape Ann landing ought to be the time for descendants of Thomas Gardner (Salem) to make sure that his name is known throughout the rest of history. Our hope is that this little start gives a push in that direction. Some say that Conant was forgotten. The forgotten ones were actually Thomas and Margaret Gardner (and John Tilly who died in 1636 - Pequot War). About process: blog posts will be labelled into groups. Too, posts will be updated with modification dates. In many cases, additional material will be included at the foot of a post as a dated remark. An example is the Fedaerated blog. Posts are done real-time, generally without using any fancy editor. That is old-fashioned, but, hey, Joyce, Tolstoy, and many more worked similarly. What is this that people have learned to depend upon a mindless artifact in order to express thoughts in a natural language? Hence, I usually put an ellipsis (...) at the end of a post to denote an 'in work' status which will be taken away once the first cut of the post is done. Subsequent updates will be marked with date. The Remarks have several purposes. For one, it is a place for additional information and commentary. Too, there may be forward links to future posts that are related. Comments are open, for now, without any moderation. The hope is that we can collect information that way. Pointers to material at other sights will always be of interest. We are using two URLs: ThomasGardnerSociety.org, and TGSoc.org. The below image is from the later which will have a particular focus as portal. The former will be our workhorse, handling specifics related to research and findings. Our major theme is culture, history, and technology. The first, of course, implies human society. History is a puzzle since, generally, it deals with an abstracted view of events, whereas we live with the details as individuals. Finally, technology is a thread that has been around for a long while; albeit, now we see acceleration of this phenomenon becoming problematic. In genealogy, we have all sorts of issues, including software, systems, and biology (DNA, for one example). The scope has a major thread of the 400 years from Cape Ann to now, however it have a broad theme covering the American dream is all that it might entail. We are coordinating our work through Gardner Research which will publish, regularly. 09/26/2010 -- Added in Margaret. If you look at royal descents (such as the Maverick/Gye royal gateway, WA -- see above), it was the wife (Mary Gye) who brought in the royal history. So, expect that all trees developed and shown here will be balanced as much as is possible with both parents. Having said that, it's obvious that information is missing for many ancestors. But, things can show up from time to time as people keep digging. 09/27/2010 -- On the process for posts, the basic gist of a post remains the same, generally. Through a window of time, though, there may be changes to grammar and some phrasing to remove awkwardness as well as to improve the overall flow. The post will be marked with the date of modification. 09/28/2010 -- Expect that there will be a post on the old burial ground which needs to be re-recognized. From what I've read, Thomas, Seeth, and Samuel's Abel, and his wife Sarah, are there. The stones were, supposedly, moved to Harmony Grove, near the Peabody Gate, when the ground was cut through, and leveled, for the road (Grove). Has anyone seen these lately? As well, we can collect burial places, to wit the Charter Street cemetery has several Gardners. This article mentions the old burial ground (we need to locate it, setup a Google map, etc.). 09/28/2010 -- About old planters. As used above, it refers to the Cape Ann & Salem group. It can also be applied to close-by Boston (note, William Jeffrey, ostensibly of the Cape Ann group, seems to be mentioned here as being in Shawmut and Weymouth) as that is where Winthrop went on rebound from his dislike of Salem. No doubt, this subject needs some looking at. Note that John Lyford (WA, following Gary Boyd Roberts, this means wife's ancestor), who went with Conant to Cape Ann, is mentioned. 10/01/2010 -- See Where is Thomas? 12/06/2010 -- See progeny I and progeny II. 12/21/2010 -- For completion, started a Henry Lunt of Newbury blog today to cover matrilineal ancestors. 01/10/2011 -- Added his signature. What was Thomas' background, his education, ...? 01/14/2011 -- Follow Salem on Twitter. 09/13/2012 -- About Margaret. We'll honor her as the ancestor, with Thomas, of the Gardner family. 10/11/2018 -- Changed Remarks list to be in order by time. Updated a few stale pointers. 11/13/2018 -- With a new twist, as bodies and stones were also moved to the Trask site. Add in Sidney Perley's map of Gardner Hill.